Obama’s Department of Homeland Security chief Jeh Johnson declared that the jailing of Central American refugees seeking asylum, and the separation of parents and children, would have a positive effect in reducing the sudden influx of refugees in 2014. It was Terry McAuliffe, the longtime crony of Hillary Clinton, who presided over the torture of immigrant teenagers at Shenandoah from 2014 to 2017. According to a half-dozen sworn statements, given by the victims in Spanish and then translated for filing with the federal court for the Western District of Virginia, children as young as 14 were beaten while handcuffed, tied down to chairs while stripped naked and hooded, and held for long periods in solitary confinement, sometimes naked and cold. 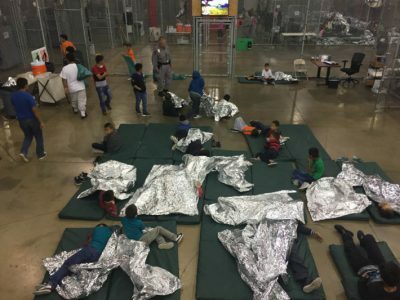 Tagged detention centers, immigrant children, mistreatement, Obama, Terry McAuliffe, torture, Trump, U.S.